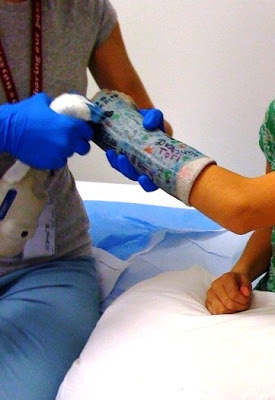 She cracked me up when, on the way to the doctor’s, she said, “I can’t wait to see what’s inside my cast, Mom! I ate a donut today and I just know I got some sprinkles in there!” Yikes. 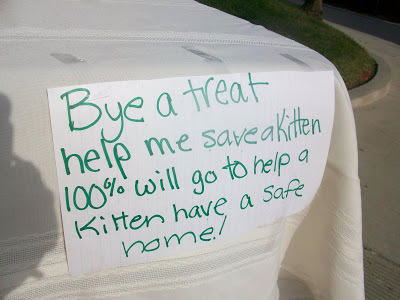 And remember when I told you how we lost our cat Chester and how my daughter made a box to save money for a new kitten? 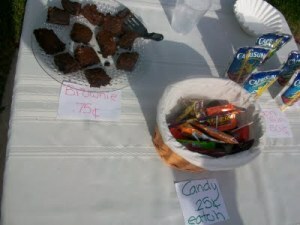 Well, yesterday she had a bake sale to raise money for her cause. I was really proud of her. She came up with the idea, baked the brownies, and set everything up herself (and this time, there was no kitchen disaster). When she first started the whole, “I’m saving my money to buy a kitten,” thing, I wasn’t sure about it, but how can I say no when she’s working so hard? She even asked me to take her to Target to look at prices for cat food and litter. Which I did. And which I’ll be writing about soon because it was one of those mom-moments that really had an impact on me. :) I’m proud of her. Hi Genny!Thanks for mentioning Noah. A few people linked over and they, too, are making cards for him. Your children are so sweet for joining in! Thank you!Have an awesome weekend! So glad to hear the cast came off! I read about Noah's story too. So heartbreaking. My heart goes out to him and his family. I'm always struck by what sweet kids you have. Their cards look great and I'm so happy your daughter got her cast off. As for the kitten-rescue project, you sure are one supportive mom! Wow! Thank you for including pictures of the cards your children made for Noah. I know he will be blessed by them!